I recently visited Charleston, South Carolina, so I could finish my latest book. While I was there, I visited Charleston Cars and Coffee and encountered a six-wheeled Land Rover Defender fire truck. It was at that moment when I realized I would have to finish my book later. And so I did. 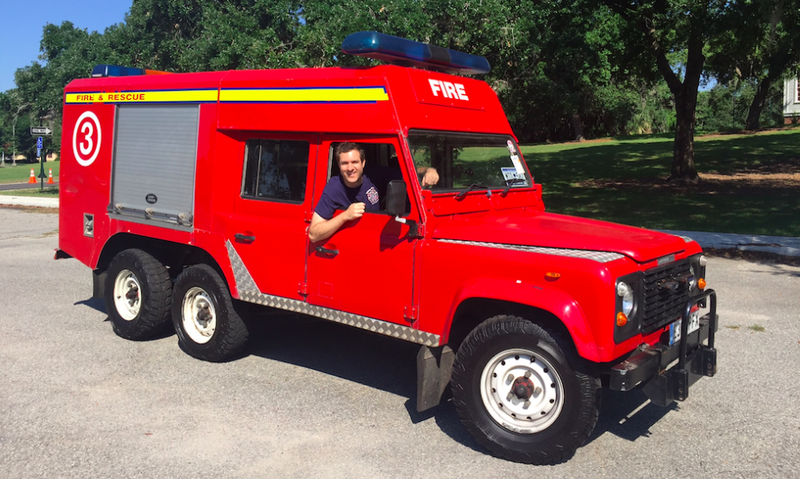 I put off the book and instead I spent an entire day with the Land Rover fire truck, courtesy of a viewer named Jacques, who imported the thing from the U.K. and runs Relic Imports in the Charleston area. Jacques imports Defenders. Jacques puts reliable Chevy V8s in Defenders. Jacques builds Defenders to suit customer whims. Jacques has a dog named Diesel. Jacques is my new hero. So here’s what happened. I arrived at Relic Imports a couple Monday mornings ago, and Jacques was there waiting for me with the Defender fire truck parked out front. We poked around his shop for a few minutes, and then I did something I have never done before: I climbed into a fire truck. I began driving. And I used the loudspeaker to scare people waiting for the bus. Before I get to the driving experience, though, a few notes about the truck itself. Note number one: it has six wheels. Those of you paying close attention will recognize that this is two more wheels than a Bugatti Veyron. Q: Does this mean the Land Rover fire truck is better than a Bugatti Veyron? Unfortunately, the Land Rover fire truck is not faster than a Bugatti Veyron. Even though all six wheels are powered, which you’d think would help it get crazy grip off the line, it also uses a 160-horsepower V8 and weighs approximately 7,500 pounds. When it’s full of water, that figure grows by an additional 2,200 pounds. The result is that it accelerates at roughly the same rate as arm hair growth. Q: When it’s full of water? A: Well, you didn’t think they filled it with PowerAde, did you? Yes, the six-wheeled Land Rover fire truck has an enormous tank in the back that can hold 265 gallons of water, which the fire department who previously owned the truck would use to a) fight fires, and b) spray down local children during the annual heat wave in Britain, where temperatures climb to 71 degrees and the sun briefly becomes visible for 19 minutes between rain showers. And the six-wheeled Land Rover fire truck doesn’t just have a water tank in back. There’s also a rear bench seat for firefighters, room for all their gear, a giant water hose, and – this is entirely true – a foam machine. Yes, there’s a foam machine. Now I bet you’re excited to watch the video. You’re probably thinking: DeMuro is gonna spray FOAM on unsuspecting bystanders! And then use the loudspeaker to laugh at them! But unfortunately, the foam machine is merely a distant memory: Jacques had to disable it before he brought the truck into America. Same goes for the water hose. You see, when you import a vehicle like the six-wheeled Land Rover fire truck, the U.S. government is worried that you might also be bringing in vast quantities of illicit substances, such as cocaine, or heroin, or plums. So you have to remove anything that could hide such substances, which means the foam machine is gone, and oxygen tanks are gone, and there are giant holes in the side of the water tank that make it look like a bear was very thirsty, and he found the Land Rover fire truck, and he decided to access the water tank using a fairly precise cutting instrument. Doesn’t this bother Jacques? His cool six-wheeled Land Rover fire truck is now disabled? Stripped of its glory? Like a clock without a minute hand? Like a pair of shoes without shoelaces? Like a lunch lady without a hair net? No, it does not. Jacques is going to drop a 500-horsepower Chevy V8 in the thing and use it as a race support vehicle. But you don’t need a 500-horsepower engine to have the time of your life behind the wheel of the six-wheeled Land Rover fire truck, as I clearly demonstrated. All you need is a zest for life, an excitement to breach into the unknown, and a quick explanation of how the siren works. I used it occasionally to move slower objects out of my way, such as earthworms. So how does it drive? Well, I already told you that it’s slow, so now I’ll explain the rest of it: handling is vague, steering is vague, the gear selector is vague, braking is terrifying, and pressing the clutch is so difficult that it might actually be easier to climb under the vehicle and manually engage the clutch every single time you want to change gears. In a sentence: I had a great time. The only real problem came when I passed cyclists on some of Charleston’s narrow streets, and I realized that the back of the truck is actually wider than the front. Imagine that: you could clear something with the front of your car, and the sides of your car, and still hit it with your rear end, sort of like an imported, six-wheeled version of Kim Kardashian.